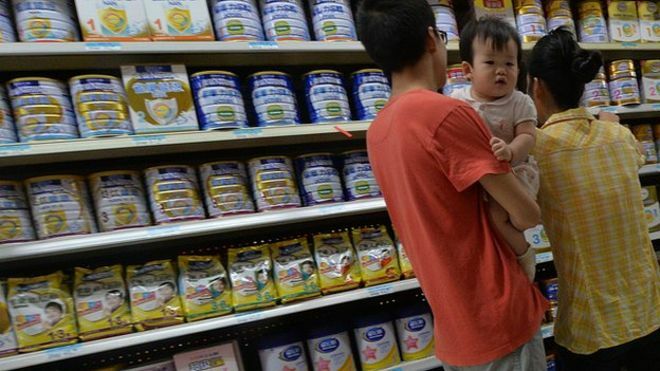 China’s food safety watchdog has asked three milk producers in Shaanxi province to recall infant formula powder, Chinese state media report. Excessive nitrate levels were detected in some powdered milk samples and the products were branded as sub-standard, Xinhua news agency said. The watchdog urged Shaanxi to punish producers found to have broken laws. The quality of milk products remains a sensitive topic in China after a deadly tainted milk scandal in 2008. At least six children died and some 300,000 fell ill after consuming milk products contaminated by melamine at that time. Imported milk became highly prized in China after the scandal. In 2013, however, the mainland imposed a temporary ban on all imports of milk powder from New Zealand after its main dairy exporter, Fonterra, found a bacterial strain that can cause botulism in some of its products . China continues to rely on New Zealand for almost all its imports of milk powder.